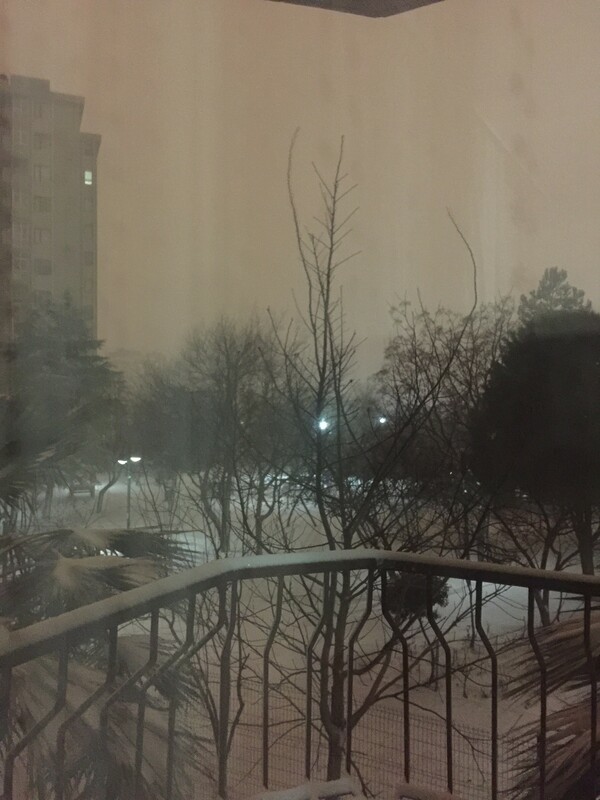 ISTANBUL – The first heavy snow glistens in the darkness of the city I’ve fallen in love with in the last year. We are six, three children and three adults, who pile in the station wagon to head home. Umesh, our Indian friend, neighbor and fellow journalist, clears the snow from the windows and turns on the engine. The car lurches forward. His wife Tripti videotapes the flakes whitening the windshield. The kids all fall asleep. My two daughters and their son lean on each other. Are they dreaming about the terrorist who killed 39 people in a nightclub on the sea last Saturday? Or making a snowman tomorrow? Few of us hide the truth from the kids anymore. There are just too many killings to keep secret. My girls are used to the terror, news of Afghanistan penetrates our home daily, and rarely does it exclude blood. I think about the mood of the dinner party we just left. Among our friends in Turkey are the parents whose children attend the same international school as our daughters. They’re smart, worldly, tolerant, speak at least two languages and hail from around the world: Germany, Turkey, Romania, Mexico, Croatia, Netherlands and us, Afghan-Americans. We have a bubble for sure, but it’s one we’ve chosen and created. We turn to each other for fun and support in a time when uncertainty and terror overwhelms Istanbul. I’m lost in thought when Umesh stops in front of our building. I hold my 5-year-old’s hand and caress my 8-year-old’s face to wake up. They groggily walk up the stairs. The guard on duty greets us with a salute. When my husband is away half of the year on business, the three guards who monitor our building around the clock make sure my girls and I have milk and bread in the morning, our garbage is taken out and no burglars enter our home. They’re here to care and protect. But tonight they may have failed. Our second floor flat can be locked four times, but I feel so safe in the building that I just shut the door behind me. That locks it once automatically. The girls complain of deep sleep and want their bed. “Just let me open the door,” I say as they both sink on the floor with exhaustion. It’s 11, two hours past their bedtime. The key enters but it doesn’t move. I try again repeatedly but it won’t turn. The silver metal usually opens with a jiggle. I notice a magnet ad on the door. It’s from a locksmith. Hmm. This is strange. My friend Hana staying with us is on the European side watching a movie. My husband Naeem is in California. They’re the only other two with a set of keys. I call Hana to ask if she has come home and locked the door from the inside. 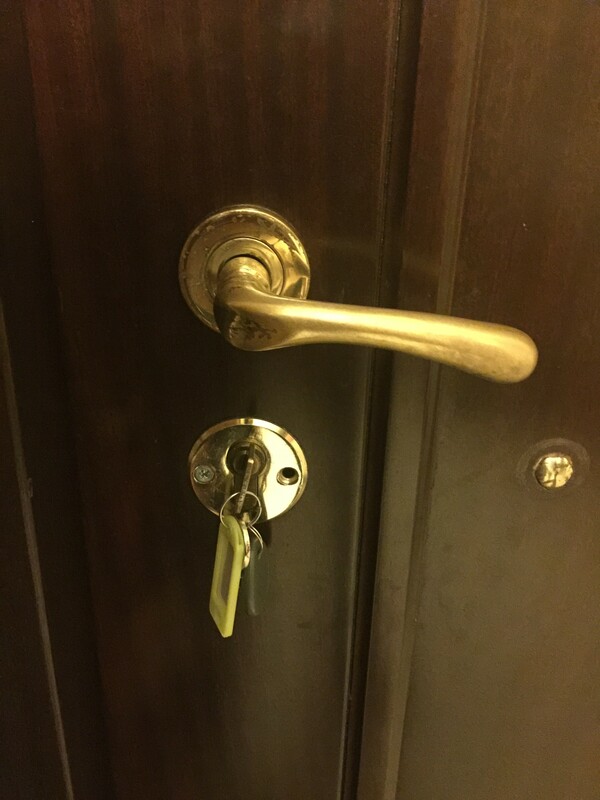 If the key is left inside, the outside door cannot be opened. Hana says she’s out. My husband is sick with the flu at work. Maybe the locksmith needed business and decided to destroy our lock so I could call them to fix it, I tell him. I call the guard and my Turkish landlord Sayda. Umer, the guard, tries the key and shakes his head. The girls are dozing on the cold floor. Her father is our neighbor and she lives several miles away. Umer has already called the possible culprit to urgently come and break the lock. Sayda tells him to cancel that and calls our usual plumber Mostafa. He has a friend who’s a locksmith. That’s a locksmith we can trust, Sayda says. A frail, elderly man of maybe 80 makes his way up the stairs. It’s Sayda’s father telling me to bring my kids downstairs to rest at his place. I carry my youngest and jolt awake my oldest to follow. They curl up on his couch. I take off my brown boots and theirs too. Amca (uncle) places a pair of blue slippers in front of my feet. He tells me not to worry and offers me tea. I sit on his red wicker chair as the TV plays an American war movie, trying to explain my theory about the crooked locksmith in my limited Turkish. He nods his head. I’m too tired to be angry. We’re still recovering from an 11-hour time difference from our holiday trip to San Francisco a week ago. The trusted plumber and locksmith appear in 10 minutes. They changed from their pajamas and trudged through the snow to help just because Sayda asked them to aid a yabanci (foreign) mother and her kids. Amca and I leave the girls asleep and climb the stairs to our flat. The locksmith has already drilled through the lock and found a key on the inside. “Who’s inside the house?” Mostafa asks me. “Bilmiyorum (I don’t know),” I whisper. Then all four of us pause in a moment of realization. A thief? I had turned the hall light on but the rest of our spacious three-bedroom flat is dark. Mostafa takes the hammer the locksmith used to break the lock, the locksmith follows him and so does Sayda’s dad. They enter the house head first, back bent one after another like the three Stooges trying to be brave but utterly afraid. Mostafa’s arms held up in a fist, eyebrows raised. He is ready to be a hero. “Amca, you stay with her,” Mostafa tells him, but uncle refuses. They turn on all the lights, search all the rooms, balconies, behind the curtains, under the beds, inside the closets. They pass the hammer to each other as they tiptoe from one room to another whispering. I stand outside peering inside the door and allow the men to find the robber, if he’s still there. The wind howls. All three of the men freeze and stare at our living room balcony. “That door looks open,” the locksmith says. He walks cautiously to the door, turns the handle but it’s locked. They find the house orderly and no one inside. Mostafa looks disappointed but uncle is smiling. “But whose key is this?” Mostafa wants to solve the mystery but I have no answers. I just tell them, korkuyorum, I’m scared. Our building has cameras and guards in one of the safest parts of the city. Who could come in and why? Sayda rings Mostafa’s cell phone and wants an update. When he shares his findings, she wants to know if the key was just inside the keyhole or locked from the inside. That might solve the mystery. Suddenly, my memory kicks in that yesterday Nuran, my friend and cleaner, had come to clean and she had a habit of locking the door from the inside. And perhaps Hana and I hadn’t noticed the indoor key before we rushed out today. That would be the boring explanation for this misadventure. Sayda concludes that the mystery was solved, and the crooked locksmith with a magnet ad on our door was wrongly accused. But he or she and Nuran don’t have to know that their actions had propelled a small manhunt on the Asian side of the Bosphorus. 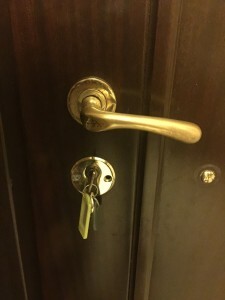 The trusted locksmith installs a temporary lock and key and promises to return tomorrow night for a permanent one. He refuses to take money until he finishes the job. I thank all of them, completely embarrassed. Mostafa puts the hammer back in the toolbox still suspicious. Our curious neighbor across the hall opens his door and wants to know what the noise is about, so we all begin to talk at the same time, explaining with sheer excitement because we have a story to tell with a happy ending. Thank God, there wasn’t a robber, we all conclude. 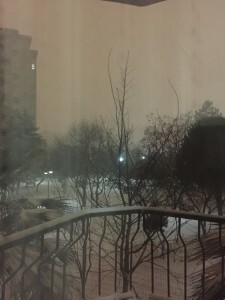 Amca and I go downstairs as the other men leave, uncle collects the girls’ shoes, my backpack, my phone with his feeble hands and accompanies me up the stairs as I convince my daughters to wake up and climb the two flights to their bed. I tuck them in and Amca breathes a sigh of relief. “Don’t forget the lock from the inside,” he says in a fatherly tone, and hobbles out the door. I check for the few valuables I keep in the house: my wedding ring, passports, some cash. It’s all there. “Jan, chia? What is it?” I ask. “What happened? Was it another coup, another attack, did people get killed?” She asks with concern.